When I was in Labrador, my young companions and my son one day (the 27th of July, 1833), procured eight individuals of this species, of different sexes and ages. Next morning I went to the place where they had been shot, and found a good number remaining. The first observation I made had reference to their notes, which, instead of resembling those of the Gold-finch, as alleged by an American writer, are very similar to those of the Siskin, and are frequently uttered both when the birds are alighted and while they are on wing. They were in small parties of seven or eight, apparently formed by the members of the same family, and although several of these groups were around me, they did not intermingle until fired at, when they all simultaneously rose on wing, mixed together, and after performing several short evolutions returned to the same bushes, separated into families, and resumed their occupations. When alighted they were quite unsuspecting, and so heedless as to allow a close approach, scarcely regarding my presence, but clinging to the branches, dexterously picking out the seeds of the alder-cones, and occasionally coming to the ground after some which had dropped. Few birds exhibit a more affectionate disposition than the Little Redpoll, and it was pleasing to see several on a twig feeding each other by passing a seed from bill to bill, one individual sometimes receiving food from his two neighbours at the same time. Occasionally, however, they shewed considerable pugnacity, and one would drive off its companion, inflicting some smart blows upon it with its bill, and uttering a low querulous chatter. In other portions of the same country, I saw flocks composed of twenty or more individuals flying loosely at a moderate height, in the undulatory manner of the American Goldfinch and Siskin, without, however, making the deep sweeps of the former; suddenly alighting, and at once beginning to search with great expertness between the stems and leaves, picking at the embryo buds while perched over them, like Jays and Titmice. So hardy is this species, that, according to Dr. RICHARDSON, it is a "permanent resident in the Fur Countries, where it may be seen in the coldest weather, on the banks of lakes and rivers, hopping among the reeds and carices, or clinging to their stalks. Although numerous throughout the year, even in the most northern districts, a partial migration takes place, as large flocks visit Pennsylvania for a month or two in severe winters." The migrations alluded to are of rare occurrence in that State, however, as well as in that of New York. I never saw one of these birds to the westward of the Alleghanies, and none were observed by Dr. TOWNSEND or Mr. NUTTALL on the Columbia river. They are abundant every cold winter in the northern parts of Massachusetts and Maine, as well as in all the British Provinces. The food of this species consists of buds, seeds of various grasses, berries, and the small leaves of bushes and trees. I have represented a male and a female on a plant which grows abundantly in the localities in which I found it in Labrador. The many young birds which I examined in the month of August, had the head entirely grey. The feathers of that part, and those on the breast and rump, were of the same colour nearly to the base, which is bluish-grey; and I suspect that they do not acquire any redness until the approach of sprint The old birds were moulting at the period mentioned, and from their appearance I concluded that all their red feathers are reassumed each spring. The eggs, from four to six in number, measure five-eighths in length, rather more than half an inch in diameter, and are pale bluish-green, sparingly dotted with reddish-brown toward the larger end. From Pennsylvania and New Jersey to Maine, in winter; inland, to Kentucky. Breeds in Maine, Nova Scotia, Newfoundland, Labrador, and the Fur Countries. Abundant. Migratory. LESSER REDPOLL, Fringilla linaria, Wils. Amer. Orn., vol. iv. p. 42. FRINGILLA LINARIA, Bonap. Syn., p. 112. LINARIA MINOR, Lesser Redpoll, Swains. & Rich. F. Bor. Amer., vol. i.p. 267. LESSER REDPOLL, Nutt. Man., vol. i. p. 512. LESSER REDPOLL, Fringilla linaria, Aud. Orn. Biog., vol. iv. p. 533. Bill short, strong, conical, compressed toward the end, extremely acute; upper mandible with the dorsal line straight, the ridge narrow, the sides convex, the edges sharp and overlapping, without notch, the tip acuminate; lower mandible with the angle short and semicircular, the dorsal line straight, the ridge broadish at the base, the sides convex, the edges sharp and inflected, the tip acute. Nostrils basal, roundish, covered by stiffish reversed feathers. Head of moderate size, roundish; neck short; body moderate. Feet of moderate length, slender; tarsus compressed, anteriorly covered with a few scutella, of which the upper are blended, posteriorly with two longitudinal plates meeting at a very acute angle; toes slender, the first with its claw as long as the third with its claw; the lateral toes equal. Claws large, moderately arched, much compressed, acute. Plumage soft, rather blended, with very little gloss, unless on the red parts. Wings of ordinary length, the first three quills almost equal, but the second longest. Tail rather long, forked. Bill yellowish, the upper mandible dusky on the ridge; iris brown; feet Blackish-brown. A band edging the forehead, the loral space, and the throat, brownish-black; the reversed feathers on the base of the bill yellowish; the crown of the head crimson; the hind part of the head, the neck, the fore part of the back, and the scapulars yellowish-brown, longitudinally streaked with blackish-brown, the feathers on the hind part of the back margined with whitish, and tipped with carmine; the wings and tail dusky, with yellowish-brown edges, and two transverse bands of the same on the tips of the first row of small coverts and the secondary coverts. 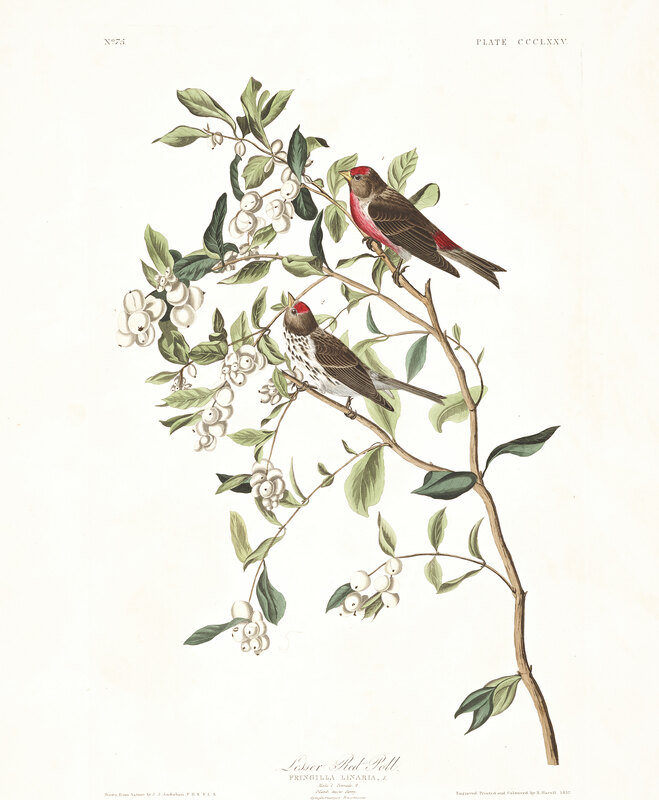 The sides of the neck, its fore part, the breast, and flanks, rich carmine; the middle of the breast, the abdomen, and the lower tail-coverts white, tinged with rose-colour; the sides longitudinally streaked with dusky. Length to end of tail 5; to end of wings 4; extent of wings 8 3/4; wing from flexure 3 2/12; tail 2 1/2; bill along the ridge (4 1/4)/12, along the edge of lower mandible (5 1/2)/12; tarsus 7/12; first toe (2 3/4)/12, its claw (4 1/4)/12; middle toe (4 1/4)/12, its claw 3/12. The female, which is somewhat less, has the black of the forehead and throat more brown, with less red on the head, and little or none on the rump, or on the lower parts, which are white, the breast and flanks longitudinally streaked with dusky.